Whether you already started back in school or are going back soon, it's never too late to learn. Earlier last year we brought you a list of five handy dandy educational apps that could help get you on your way to acing your studies. It's that time again, with five additional apps to help keep you in the learning mood. 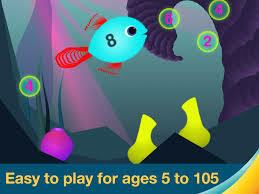 Where Math Ninja HD focused more on simplistic equations, Motion Math HD is a quite challenging game that asks players to place numbers on their proper location on the number line. Decimals, fractions, and percentages must be slotted correctly using the iPad's internal gyroscope. Tilting the iPad left or right is easy to learn, but as the difficulty ramps up you'll need to have quick reflexes and lightning-fast problem resolution skills. All of this, and it's fun. The periodic table isn't an especially exciting subject for most students, but The Elements: A Visual Exploration makes things considerably more interesting. You can choose any element and see it displayed on the screen in glorious HD. From there, you can fully rotate each element for a better, more relevant understanding than trying to visualize it without a reference. It's a bit pricey, but worth every penny for anyone struggling to conceptualize the elements or memorize them. Inject a little culture into your daily routine with DailyArt, an app designed to deliver a different piece of fine art each day. A classic painting with each sunrise is a great day to take in something new, and learn a little something while you're at it. Tapping the day's patining will offer a quick description courtesy of Wikipedia, and there are handy sharing options via email, Twitter, or Facebook to spread some culture around. This versatile app can be used offline and features a dictionary, thesaurus, and a word of the day option to beef up vocabularies and enrich word choice. There's also a huge selection of example sentences, word origins, and even audio pronunciations. It's perfect for those who aren't always connected to the internet, offering its entire library without wi-fi or 3G connection, making it especially useful for younger users who may not be plugged in 24/7 like adults. Learning about music is best done hands-on, and few do it better than Apple's own Garage Band. Several instruments are available for users to play around with, offering hands-on practice and play with professional-sounding tools. What's more, these tools can be used to create studio-quality recordings that could very well blossom into a top-40 hit someday. It all has to start somewhere, and what better way to learn than immersing yourself completely?